Busy Philipps is excited for the holiday season, despite her insane schedule. The actor, who hosts the E! late-night show "Busy Tonight,” recently published a memoir “This Will Only Hurt A Little,” and is a full-time mother of two daughters. But she doesn't feel stressed. "I know that people talk about it being overwhelming. To me, it’s really not," she told "Good Morning America," on her excitement over the holiday season. "I love three parties in one night. I love all the stuff where you get to see people that you only get to see once or twice a year," she shared. One of the best aspects of the festive season for Philipps is the opportunity to catch up with close friends and acquaintances. "Having family come over and eating too much meat and cheese, all that stuff — it’s really a special time. My girls get very into it, so the chaos or whatever that people talk about with the holidays doesn’t really bog me down. I think it’s such a gift to be able to reconnect with people." To celebrate this year, she’s alleviating some of the stress of the festivities with some additional help. "This year I’m going to hire someone to hang the lights outside of my house because I cannot take the time to do it. Also, I can’t ever figure out how you get them on a timer. Listen — we all have our strengths," she said. "So I’m outsourcing the lights, which is exciting." She also partnered with an online stationary boutique, Tiny Prints, in support of one of her favorite non-profits, Baby2Baby, for her family’s holiday cards. Baby2Baby provides essential items, like clothing and diapers, to low-income children, ages 0-12 years. Philipps has worked with the non-profit for several years. "Giving back to me is always important for me throughout the year but especially around the holidays. It feels even more important," she said. "Tiny Prints has been a big supporter of ours at Baby2Baby for the last 5 years, so when they asked if I wanted to partner with them and do this special holiday collection of holiday cards that will benefit Baby2Baby I could not resist, especially because I needed to make my own holiday cards this year." "I just felt like it was such a great way for people to be able to support an amazing charity and do something they’re gonna do anyways, which is get their holiday cards!" she added. 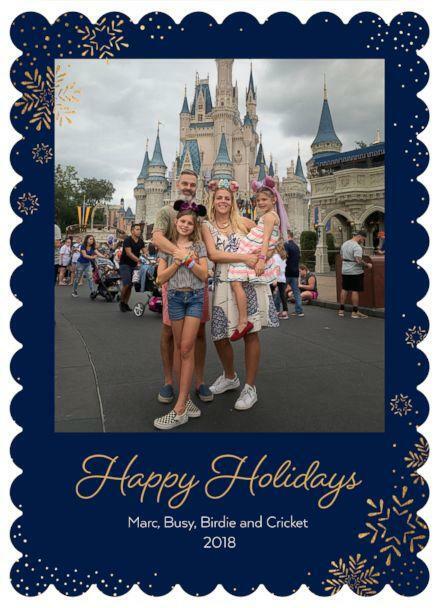 Philipps has several Christmas traditions she does with her husband and daughters. "We always do cookies. The girls love the traditional sugar cookies, cutout cookies that they decorate," she said. "We always like to make the hand print ornaments — a lot of arts and crafts in the house over the holidays. We try to get some really creative one’s going." "We have elves on a shelf in our house, so those elves will be showing up real soon," she added. Philipps shared a photo of the new visitors on her Instagram account. In order to stay sane during the holiday season, Phillips says people shouldn’t be afraid to say no to things, despite the fact that she tends to accept any invite that comes her way. "Figure out what you’re doing and know that if you’re going to feel overextended — you don’t have to say yes," she shared. "It should be fun, so if it feels stressful — take a bath. Sit it out. No one’s telling you have to go to every single party and eat every single cookie. I think people have a hard time listening to themselves and being able to say no when they need to say no," she added.